Watch the first episode of Pose Season 2 at the Pride Center! Event is 8:00 pm to 10:00 pm, show starts at 9:00 pm sharp! Our new building is located at 28 S. Franklin Street in Nyack, NY. It is at the corner of Franklin and Jackson Ave., across the street from the Orangetown Police Substation. The entrance is located on Jackson Ave.
We ask that attendees park in the Nyack Municipal Lot located off Cedar St. This lot is a two-block walk from the new Pride Center building. Please leave time to park and arrive at the Pride Center on time. All parking meters are in effect from 11:00 am to 6:00 pm and 11:00 pm to 6:00 am Monday through Sunday. The cost for the meters is $0.75 per hour. Because we want to be good neighbors, please do not park in or walk through the private lot directly across Franklin Street from the Pride Center. Instead, park in the Municipal Lot and follow Artopee Way past the bus stop. There is also a small lot on Jackson that is not open to public parking. This event will take place on the ground floor of the Pride Center. The entrance door is level with the street, with two steps down into the room. These steps will be navigable by a temporary, metal wheelchair ramp. There is a single-occupant, gender neutral restroom on the ground floor. This space meets ADA requirements and clearances, and there is a grab bar near the toilet. 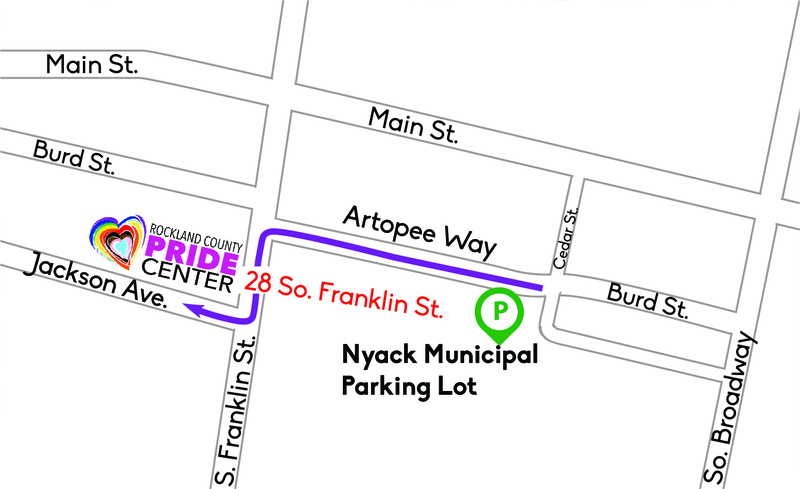 If you need additional information about accessibility, please contact the Pride Center at (845) 353-6300 or by email at pride@rocklandpridecenter.org.